isabellachoate | Swan Canoe Club Inc.
Our annual Rod Fry Memorial Race was held on Sunday, this past weekend. For those members who have recently joined the club – Rod Fry was a long time member of the club and a National and International acclaimed C1/C2 paddler, sadly Rod is no longer with us – he is missed by many in the paddling community and his legacy carries on in our annual event. 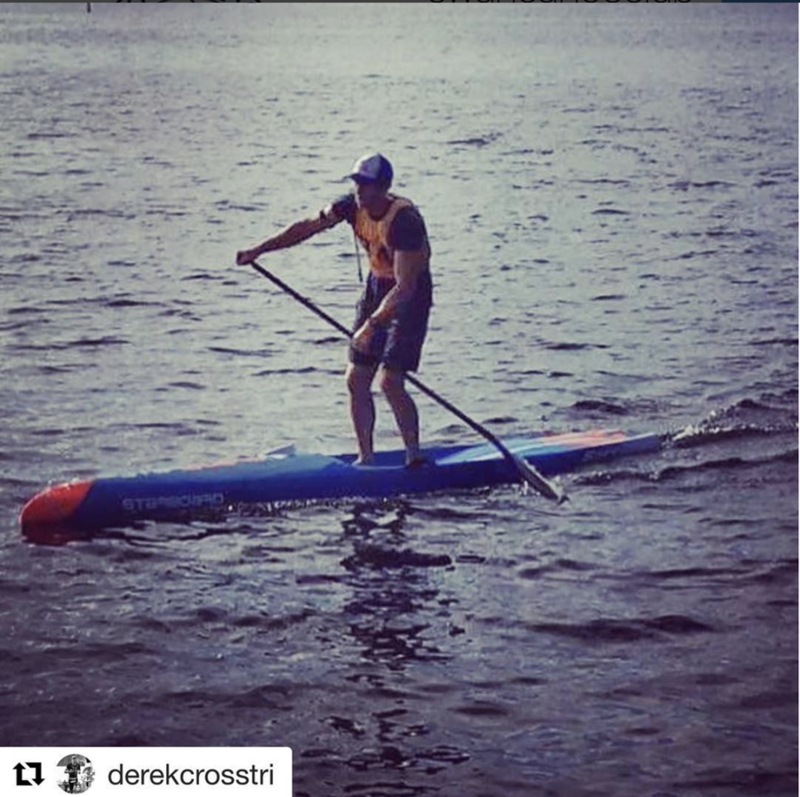 Again this year, the event was highly successful, over 70 participants in different disciplines and for the first time a SUP race to the 6km marker and back (awesome!!!). I didn’t race this year instead I had the pleasure of supporting all the paddlers to the finishing line as I was on the jetty with the rest of the timekeeping crew, I got really excited following the hard work of entrants chasing down times or their competition to the line. It was a great day weather wise we started early to miss the boat traffic at Freo, which I believe, in comparison to previous years was an improvement. I want to say a big thank-you to all who took part and made it such a fun event. 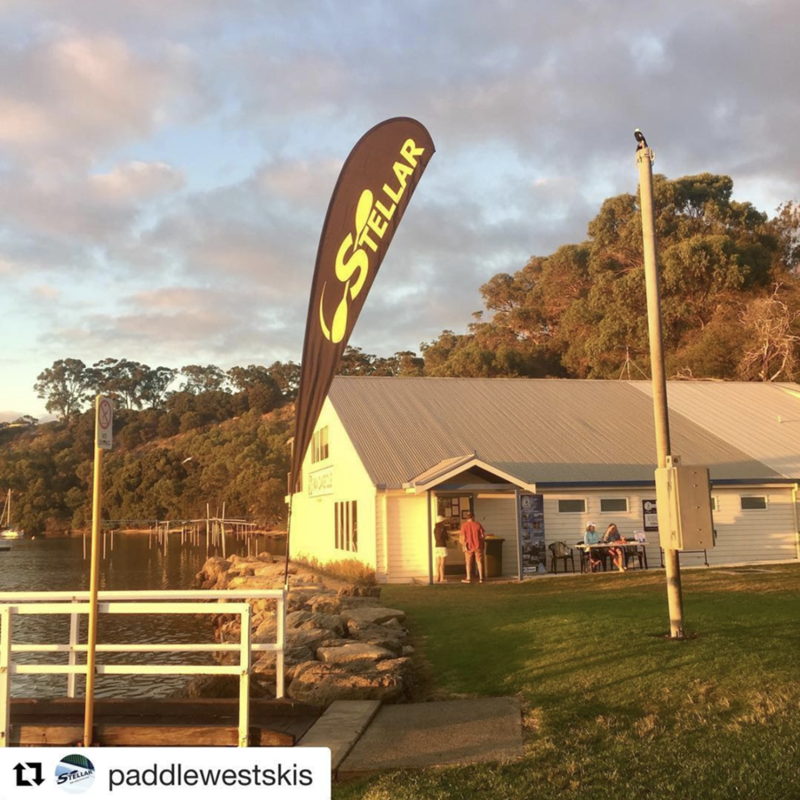 Stellar Kayaks & Surf Skis – provided a great prize for the raffle draw. Bakers Delight – always give generously to our event they are in the shopping centre in Mosman Park – if you are around that way pay them a visit – always service with a smile. 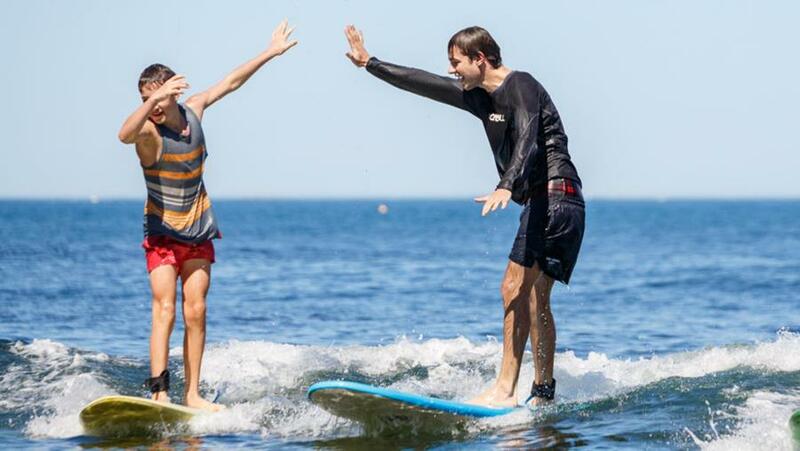 Zephyrs – are there for our daily paddlers providing a coffee and breakfast menu. Members please pop in to say hello and help support us by supporting them. Safety is key for this event we are on a busy part of the river and a safe crossing of the channel is paramount. Thank you to Fremantle Sea Rescue for providing a safety vessel and crew, without their services the race would not be possible. A big thank you to Demi O’Brien who worked tirelessly on registrations and was the main point of contact for all the non-Swannies who competed. 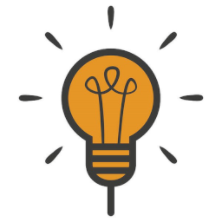 Lee Edwards has organised this event for the last 4 years – it’s a huge commitment and Lee has been responsible for the safe running of this event – a lot of upfront hard work organising people and services to be in the right place at the right time. This will be the last time this event will be run by Lee so I want to give him a big big thank-you for the last 4 years support. All the other volunteers that work behind the scenes making this successful, Janet O, Janet V, Trish, Marty, Frank, Darren Rose and Shirley Go – making BBQ, cakes, sausage rolls, raffle etc. available – thank-you so much and if I have left anyone out apologies I know there are those who work behind the scenes. Thank you to the group who cleaned out the Boatshed on Saturday morning and to John Williams and the others who cleaned up after the race. Thank you to Isabella Choate and Demi O’Brien who together with Lee worked hard to make this a very successful event – well done and a big thank-you. And finally, thank you to all the competitors, for making it a fun race and for getting out on the water and doing their best! Congratulations to William Lee and Amanda Bowman, the fastest male and females on the water. To see a full list of results and times, click on the button below. 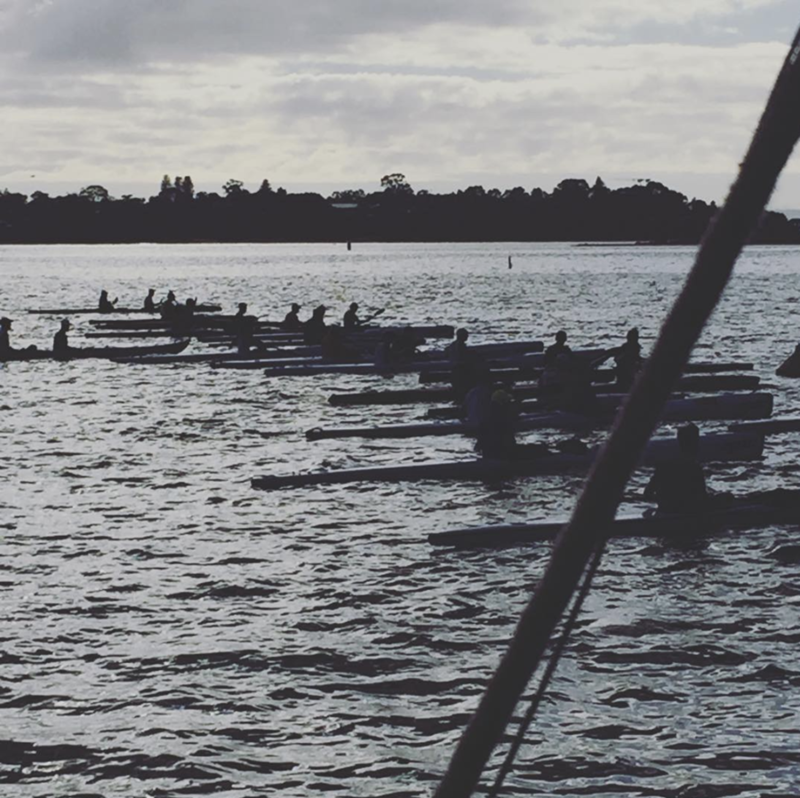 If anyone has any photos from the day, please send them to admin@swancanoeclub.org.au so that we can share them with everyone! If you have any queries, please don’t hesitate to contact us! We have had some beautiful days recently, we hope everyone has had the chance to get out on the water. There are some exciting new courses and events coming up, so save the dates and don’t miss out! Congratulations to our Swan paddlers Jack Choate (U18), Alexandria Choate (U18) and Demelza Wall (U23) for being selected on to the Australian Junior and U23 Teams respectively. After an intense series of selection races including the Australian Nationals, Oceania and Australian Open, our athletes were selected to compete in the World Championships being held in Ivrea, Italy (17th – 22nd July). To follow their journey and watch them compete later in the year, watch this space! Our member Marjan is raising money for Princess Margaret Hospital next month by abseiling down the tallest building in Perth! Although a complete novice, Marjan will be abseiling 160m, or 40 storeys down the QV1 building on St. Georges Terrace, on April 21st. Lets help Marjan smash her goal of $750, and come down on the day to cheer her on! Do you fancy paddling Ningaloo, Shark Bay, or maybe the Whitsundays? Maybe closer to home, Broke Inlet, Penguin Island or Garden Island? Perhaps you would kist like to learn how to rescue fellow paddlers, and how to ‘edge’ your sea kayaking so you can turn more easily. If so, contact Geoff Emery on gemry13@gmail.com or 0403 604 082. Come along for an hour skills session at the club, between 6.00pm and 7.00pm on the following dates. WEEK 2. 8/3/1 Support Strokes & Turning Strokes. Geoff Emery at gemry13@gmail.com or 0403 604 082. Hear what everyone is talking about – Take the Plunge in 2018 ! 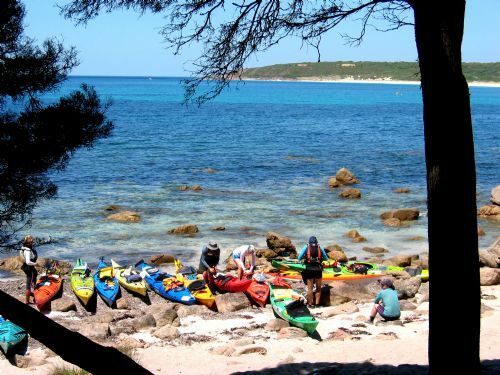 “Western Australia’s longest running multi-sport adventure race continues to provide the missing element of annual fun runs and distance swims by inspiring and challenging both individuals and families alike to undertake a challenge of the mind, the body and the spirit whilst introducing them to to the unique skills and strategies of paddle and power-dinghy racing. 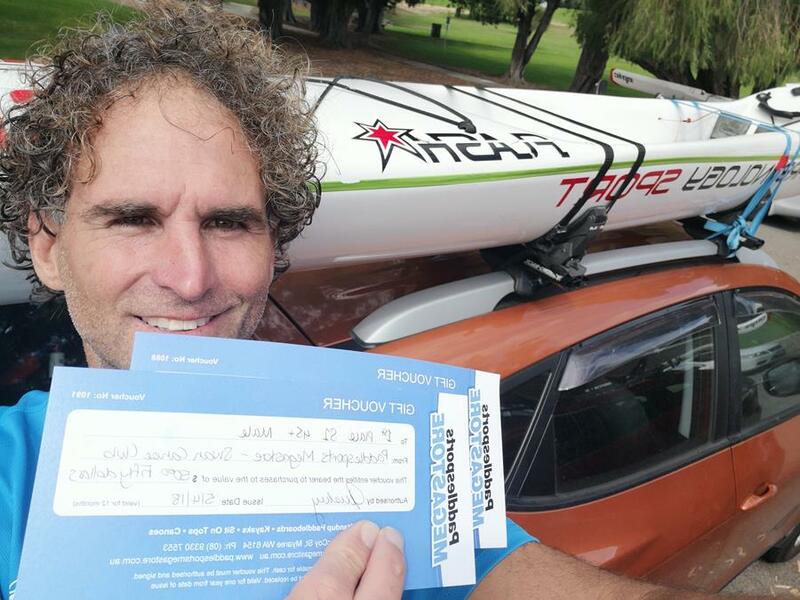 To successfully complete the 124 kilometres of the Avon and Swan Rivers from Northam to Perth is not only a challenge for the competitor but also the support crews who follow and support their every move. Success as a competitor is as much a success for the families and individuals that support them and to succeed is a team effort to be celebrated and appreciated by all involved from the time of early craft preparation, through training days, weekends and the excitement of the competition weekend. For those of you with boat-spaces, please ensure that your name and number is visible on your craft, and please return the new terms of agreement form! Hopefully everyone has had a lovely Christmas and New Years! 2018 brings lots of exciting club events and opportunities for both old members and new members. We have had a slight change in office, with the fabulous Olivia being whisked away by Paddle WA. Taking her place is the very capable Demi O’Brien and Isabella Choate. At this stage they will be in office every Thursday between 10:00 and 13:00. 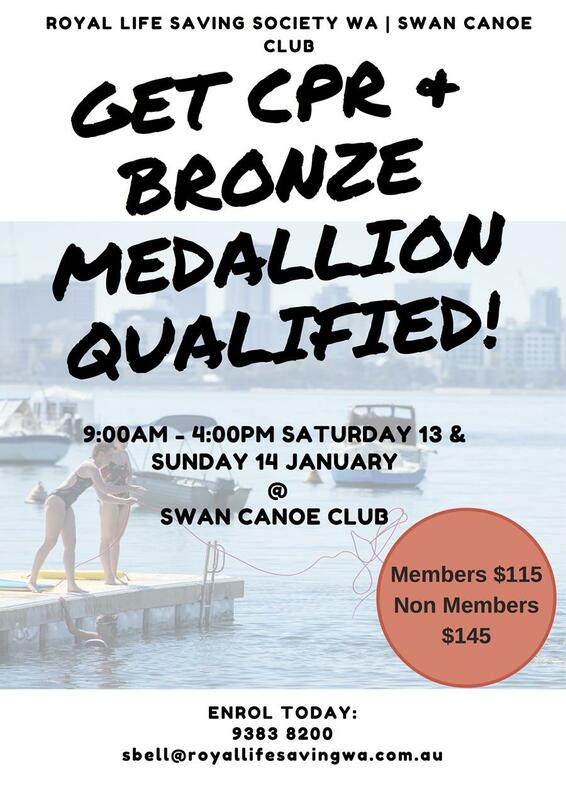 Please feel free to drop by or contact them at admin@swancanoeclub.org.au or 0466677497. We hope to see you out on the water. 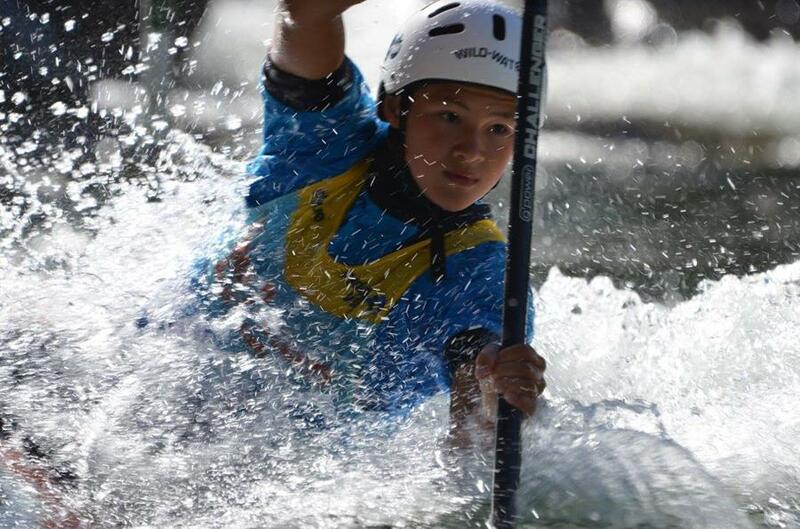 Many of our own talented juniors are currently over in Eildon, Victoria getting ready to compete in the National Schools competition and Australia Canoe Slalom Championships from January 4th – January 12th. The junior paddlers will also be joined by their coach Zlatan Ibrahimbegovic. This is an exciting opportunity to complete your bronze medallion from the comfort of our club. 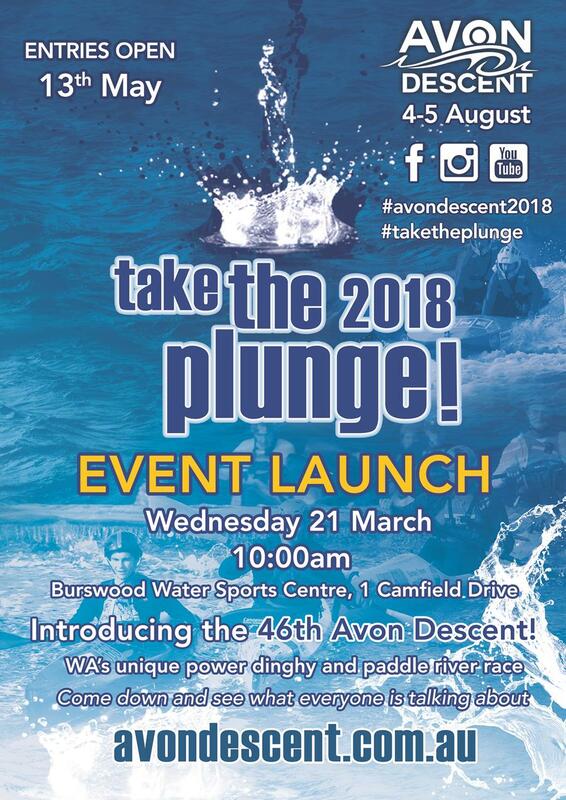 Royal Life Saving is conducting this in the river as inland waterways account for majority of all drowning deaths in WA and are extremely dynamic environments. It would be a great safety addition to your kayaking adventures! Celebrate Perth Festival’s two-year commission of Museum of Water by Amy Sharrocks with a program of events you can watch, listen to and, most importantly, jump in and be part of. Spend your Festival weekends poolside listening to swimmers manifestos, make water crafts with a maritime archaeologist, distil this years festival scent, Damask Rose, learn how to have a three minute shower and explore your grace and stamina by dancing in water with Rio Olympic synchronised swimmers! Every Saturday you can meet the custodians who look after the Museum of Water collection as they share new water donations and precious stories at Fremantle Arts Centre. And every Sunday enjoy music from Africa and the Indian Ocean at Sunday Music; The Oceanic Sessions. Registrations for all events are now open and capacity is limited, so secure your spot before we head into the New Year. Explore weekend highlights below and the full program online now. 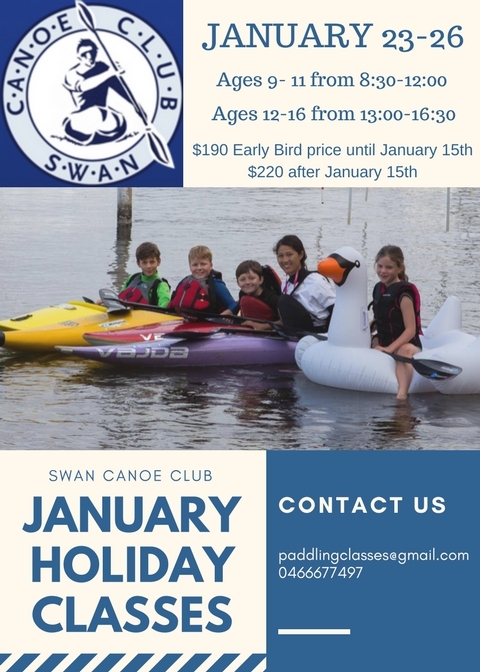 We invite you to involve all Juniors in the Swan Canoe Club – January Holiday Classes. 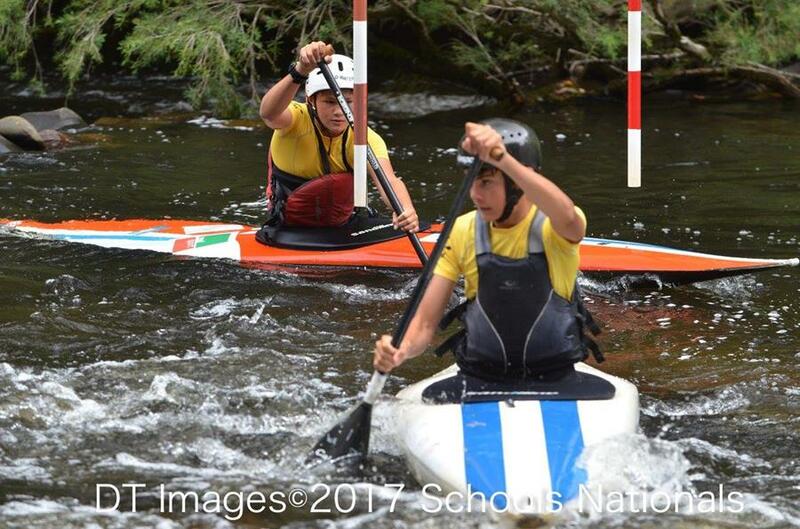 2018 brings an exciting program that welcomes you to learn to kayak. Kids aged from 9-16. The cost of the January Holiday Classes is $190 per person until the 16th. Past this date, the course is $220. Being a Swan Canoe Club member is not necessary. Hi, for those of you who don’t know me, I’m Izzie. I have been paddling and a member of Swan Canoe Club since I was born. I’m a slalom paddler and coach and have been a Swan committee member for the past year. If you see me around, please say hi! Hi All! My name is Demi and I have been a member of the Club for 10 years as of 2018. 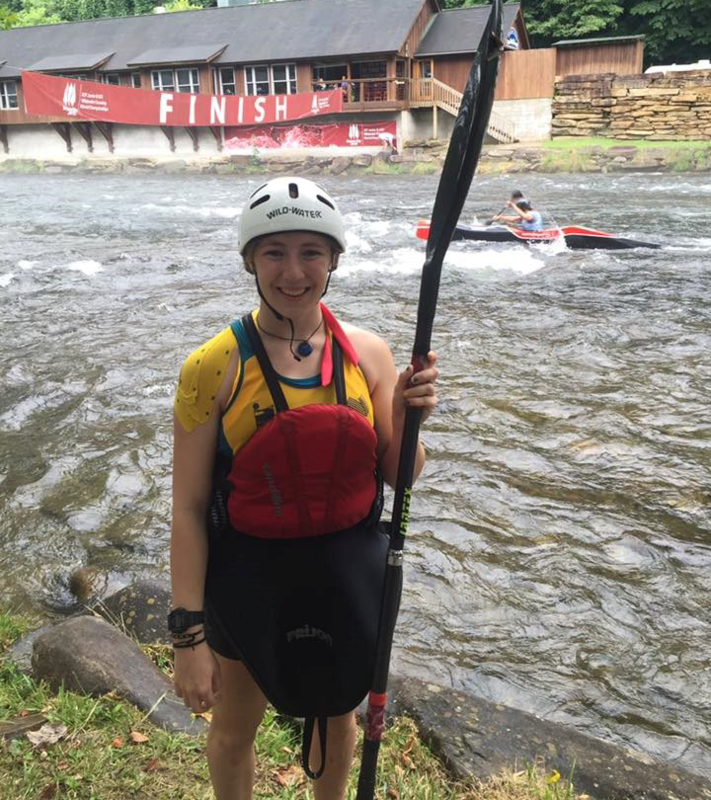 I paddle many different disciplines including sprint kayaking, downriver kayaking, surf ski racing, and slalom kayaking. I can’t wait to meet you all on the water!